Infinity can feature in games in various forms: we can play games of infinite length, with infinitely many players, or allow for infinitely many moves or strategies. Games of infinite length have been thoroughly investigated by mathematicians and have played a central role in mathematical logic. However, their applications go far beyond mathematics: they feature prominently in theoretical computer science, philosophical Gedankenexperiments, as limit cases in economical applications, and in many other applications. 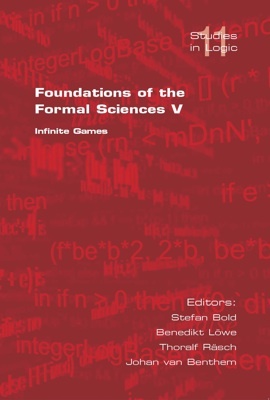 The conference Foundations of the Formal Sciences V focused on games of infinite length, but was very opn to include other notions of infinity in games as well. It brought together researchers from the various areas that employ infinitary game techniques to talk about similarities and dissimilarities of the different approaches and develop cross-cultural bridges. This volume contains the fully refereed proceedings of the conference and provides a healthy and interesting mixture of research papers and surveys for a broad audience.